Thank you for the details. I have always wanted to "sink" my machine in a table like my mother's old Singer. It is so much more comfortable for sewing anything, not just for FMQ. This will be a ibg help for my not-so-handy hubby and his even less-so assistant. I bet you'll do fine. Remember good enough is perfect. The problem is getting the hole cut out perfectly. I'd be afraid that I'd ruin the table! Looks great! Hubby cut slightly small and then worked out from there. This was a free table, as it was destined for someone’s trash so we had nothing to lose and I think we gained a bunch! I forgot about that part! I put thick felt feet under the table legs, since I knew I’d be sliding the table around sometimes. Probably helps with the vibration factor too. Wonderful! My DH found a harvest table on CL for $30, and brought it home. He cut out the opening and actually did a suspended shelf to hold up my machine using really long carriage bolts that he hung from the top down. With rounded edges, it doesn't affect the table top at all, but the nice thing is I can vacuum underneath easily. This was particular important as my cords, on/off switch, etc ended up UNDER the table. So I plugged in to a plug that works off a switch, and its PERFECT. Makes such a difference when quilting, doesn't it? Definitely going to give this a try!!! May take the metal top off of a Army issue desk and put a wooden top on it then cover the wood with Formica... You goy my mental 'cogs' a working! Thanks! You could have used some gesso or primer on the press board before painting to seal off any varnish left behind.I would have used an automotive brillo pad (flat and rectangular ) made for scuffing auto paint in prep for new paint. Love the table! This was the answer we were looking for. My husband decided to take the idea of carriage bolts one step further. He used all thread and the mounting plates (used to attach furniture legs) He then suspended the bottom piece of wood on the all thread using nuts and washers, and we were able to easily level each of the four corners individually. Using this idea, we did not have to drill holes through the table. That's great! A good surface for quilting is so wonderful. Hi. I would really like to see pictures of what you did here just so I am totally clear on what was done. Being a handy person, I think I could accomplish this if I could see it. Thanks so much and happy sewing!! We are getting ready to move so I figure this is the perfect time to set myself up with a quilting studio! Have been looking online and was kind of discouraged because the ready-mades arelimsy or pricey or too small to be much use for quilting. This plan is great! Thanks so much! Will start looking for a freeby table online tonight! A great table is such a help. I hope you find a good one. Love this idea!! Am currently weighing options for a better set-up myself. 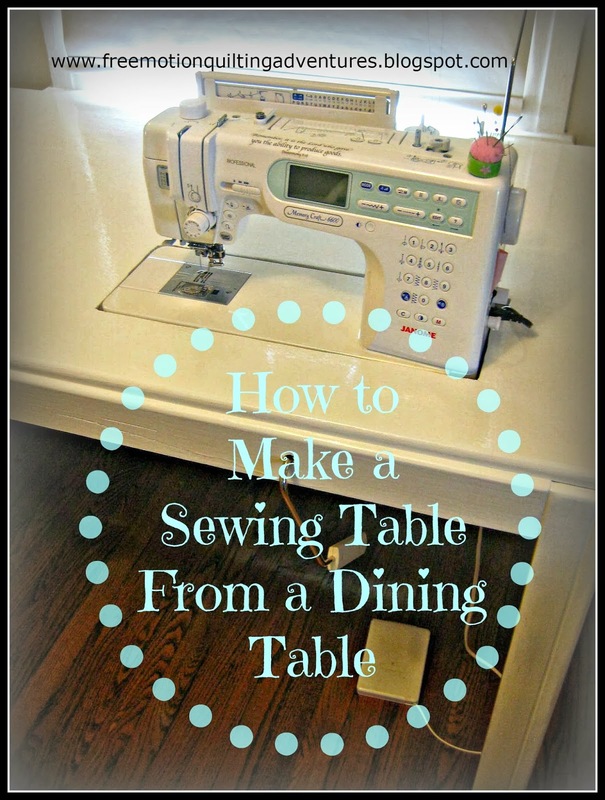 How did you determine how far from the front edge the sewing machine needed to be? In other words, when you are sitting in front of the machine, how did you determine how far away from you the machine needed to be? I wanted as much room between me and the machine as I could get to support the quilt without straining my arms but I also wanted to make sure I could still use the knee lift bar. I am VERY new to FMQ. I made a slot-in table for my machine, got a gas lift chair given to m and set the foot pedal up on a higher box. A table like this would be much better but no spare tables where I live (remote Australia). What does the knee lift do/lift? A knee lift is a feature on certain sewing machines. It allows you to raise the presser foot with your knee, leaving both hands free to manipulate your project. My DH and I used a large executive desk. We cut out the front middle and suspended the cut out piece with large L brackets. We set my machine on that piece of board. I was lucky enough to have a plexiglass piece that fit flush on top of the desk and around my machine. The bonus!! Side drawers for my sewing tools. Wonderful share!! Years ago my hubby made a cabinet for me from a bed room dresser I no longer used by eliminating the middle drawers. Used similar method for the drop-down sewing machine your hubby used. This gave me three drawers on each side. I don't know what he would have done for the knee lift. Your hubby's idea is a good one. At that time, sewing machines didn't have a knew lift like my newer machine. Might make one for my Janome if I can get hubby to cooperate. Thanks loads. What is the ideal height of table to convert to a sewing table? I think the height is relative to your chair, especially if it's a non-adjustable chair. The important thing is ergonomically, you want your forearms at a 90 degree angle to your body and parallel to the table's surface as you quilt. For a reference, my table is 30 inches high. 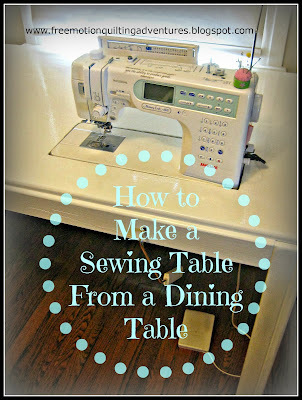 I've seen folks sew at counter-top high tables by using a tall chair and placing the foot pedal on a platform. I had mine custom made for a quarter of the cost of the fancy store bought ones. And they fit my space. For what a K...., one costs, I got cabinets, shelves, drawers and an air lift. Outfitted my whole room! Amy, instead of my "Supreme Slider" I now use "silicon spray" and for touch ups my silicon cloth that is used for my weapons. If you have ever sewn your slider in one of your quilts or got stuck in the hole for the needle......the spray is awesome. Love the table, your honey does good work! my son used and old sewing machine cabinet and did the same thing put a shelf to hold the machine using long threaded bolts to hold and I cut and old cutting mat to cover the hole a bit better works great and storage too. That's nice. My Brother CS6000i Sewing Machine came with an extension table.